Henri Jokiharju #28 of the Chicago Blackhawks in action against the Calgary Flames during an NHL game at Scotiabank Saddledome on November 3, 2018 in Calgary, Alberta, Canada. 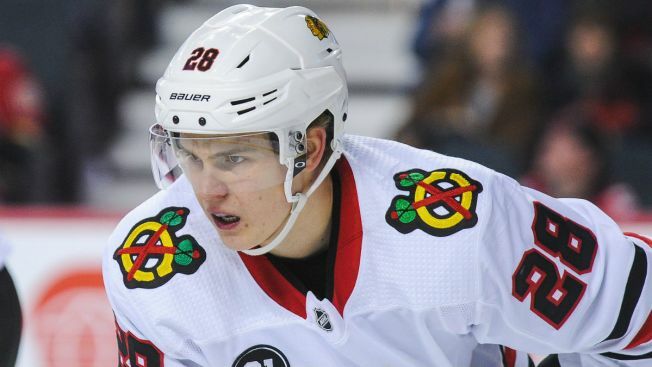 The Chicago Blackhawks have recalled defenseman Henri Jokiharju from the AHL’s Rockford IceHogs as the team deals with some injury concerns on their blue line. Jokiharju, who was sent down by the Blackhawks earlier this season after registering 12 assists in 37 games, will likely suit up against the Colorado Avalanche at the United Center on Friday night. Defenseman Carl Dahlstrom did not participate in Friday’s morning skate for the Blackhawks, as he is dealing with flu-like symptoms. Defenseman Brent Seabrook is also questionable for Friday night’s game as he continues to battle an abdominal strain that has kept him out of the team’s previous two contests. In the nine games since Jokiharju had been sent to the minors, he has been playing well, with a goal and eight assists in those games. The Blackhawks and Avalanche will drop the puck at 6:30 p.m. Friday night, and the game can be seen on NBC Sports Chicago.